A room divider aquarium in a Derbyshire home. 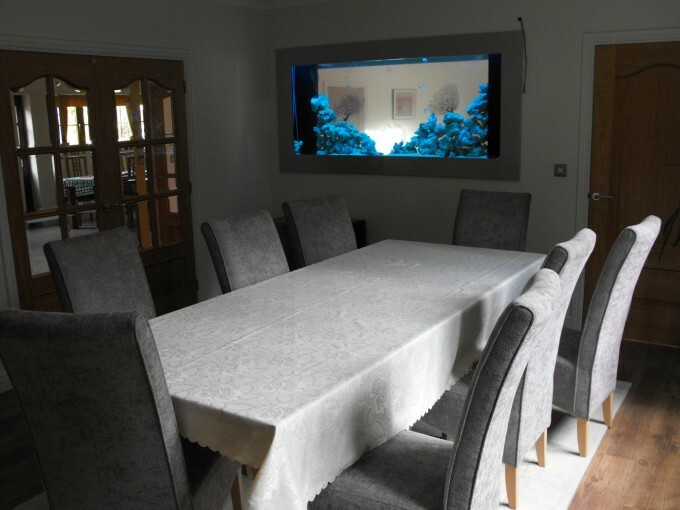 The aquarium has two separate identities, in that on the dining room side it is finished flush to the wall and in brushed aluminium trim whereas on the hallway side, the aquarium is bow fronted and finished in Oak to match the doors and joinery in the hall. It is a tropical freshwater aquarium but has been designed so that it can easily be converted to a marine aquarium at a later date. This room divider aquarium was built in 15mm glass due to its height and fitted with blue as well as white lights. The blue lights give off an ambient glow in the room.